Situated just south of the Carolina border in the scenic foothills of the Appalachian Mountains, Cherokee County offers the charm of small-town life and country living with the convenience of nearby metropolitan areas. 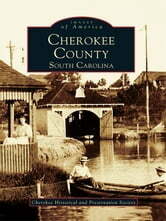 In 1897, the year of its founding, the county inherited a rich history that began with the Cherokee Indians. Home to two American Revolutionary War sites, Cowpens National Battlefield and Kings Mountain Military Park, as well as the Overmountain Victory National Trail, it exists as a bevy of historical sites that date before the county was established. Cherokee County pays tribute to this community's decisive history and celebrates the local architecture, business establishments, and residents, both past and present. Historic views, coupled with informative text, highlight the 1914 Carnegie Library, the charming railroad depot, the Limestone Quarry, and construction of the towering smokestack of Gaffney Manufacturing Company. Vintage photographs depict downtown Gaffney, settled almost a century before Cherokee County became a political entity, and historic Blacksburg, known as Black Station before 1888, while bringing to life the evolution of the 1845 Limestone Springs Female High School into the state's popular Limestone College of today.